On a trip with the family to NY, we stopped in Tarrytown and grabbed lunch at Horsefeathers. While the children opted for their usual chicken fingers and my better half selected a turkey burger, I went for the Old English. The Old English is a burger with cheddar cheese and bacon on an English muffin. As an extra little something, I had them throw a fried egg on top. So, with a burger and bacon and cheddar and an egg, I needed a big beer. 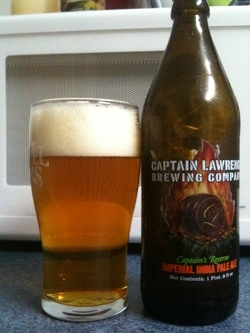 I found one in the Captain Lawrence Brewing Company’s – Captain’s Reserve Imperial IPA . I found the Imperial IPA to have the following characteristics. Appearance: Clear, golden. Lots of foam and lacing. Aroma: Lemon, grapefruit and hops. Taste: Smooth, refereshing with a hoppy tang and a slightly bitter finish. This was a really good beer and more importantly, an exceptional pairing with my lunch. If you are in Tarrytown, go to Horsefeathers. And, if you see the Captain’s Reserve Imperial IPA, buy it. You won’t be disappointed with either. Good timing! I have a bottle in the fridge that I picked up at Whole Foods this week. Looking forward to it. I’m also looking forward to checking out Captain Lawerence’s smoked porter. As great as Alaska’s is, it’s not easy to find. Alaskan Smoked Porter was one of my original Holy Grail Ales. I’ve been lucky enough to have each year’s vintages from 2005 through last year and I still have a few 2008 bombers in the Craft Beer Closet. Capt Lawrence’s version is quite good but not nearly as interesting as Alaskan. I really liked the beer. The only problem was the timing (middle of the day, car full of kids). Otherwise, this could have turned into a longer session. Horsefeathers has a really good bottle list and I would have been tempted to keep trying something new. I had that at Blue Smoke in NYC one snowy January afternoon. A really well balanced IIPA. One of the better East Coast versions. Would make a good Parcheese brew. I am shocked that you read my review and didn’t Monger all over it. While my experience with the West Coast versions has been brief, I found the Captain Lawrence to be a very respectable entry. Not sure if it really is a Parcheesi brew but it certaily was a great bacon-eggy-cheesey brew.